An object like this brooch can tell a thousand stories. Are these two lovers on a romantic ride? Are they escaping and rowing into the sunset, never to return again? Have they been separated and is this the first time they’ve seen each other in years? The choices are endless, and that is only part of the magical quality of a gem-encrusted gold brooch such as this. Made by Italian goldsmith and jeweler Carlo Giuliano in the last quarter of the nineteenth century, this brooch was created in the Renaissance style with four button pearls, five half-pearls, six rubies, eleven emeralds, four sapphires, and eleven rose diamonds. Every piece of Giuliano’s work is intensely detailed, whether in crafting, enameling, or its materials. By basing his work on the combination of the Renaissance style, Greek and Etruscan influences, and a twist of Art Nouveau as it was just emerging, Giuliano delicately crafted his own style balanced by centuries of inspiration. Doves, present here in the front of the boat, directly represent the two lovers as eternal symbols of love and peace. Aphrodite, the Greek goddess of love, is often depicted with doves present. The chosen gemstones also hold symbolic meaning. Pearls are symbols of prosperity and success, surrounding the wearer with an aura of calm and beauty. Perhaps their selection is intended to show a happy future for the couple with a lack of obstacles and uncertainties. The ruby’s attribute is intense power, granting the owner eternal contentment and peace. Also a symbol of vitality, the ruby could represent the lovers’ future and their eternal passion for one another. The emerald is known as the sacred stone of Venus, the Roman goddess of love. It also symbolizes hope in many cultures, as well as faith – a symbol of loyalty in love. The sapphire is known as the stone of destiny, a gem meant to contribute to mental clarity and perception, another fitting choice for the lovers. Finally, the diamond is one of the most valued gemstones. Diamonds are symbols of innocence and constancy, often used as the centerpiece in engagement rings to promote longevity for the wearer. Alone, these gemstones are powerful, but placed together in formation surrounding the brooch’s lovers, they contribute a rich narrative. 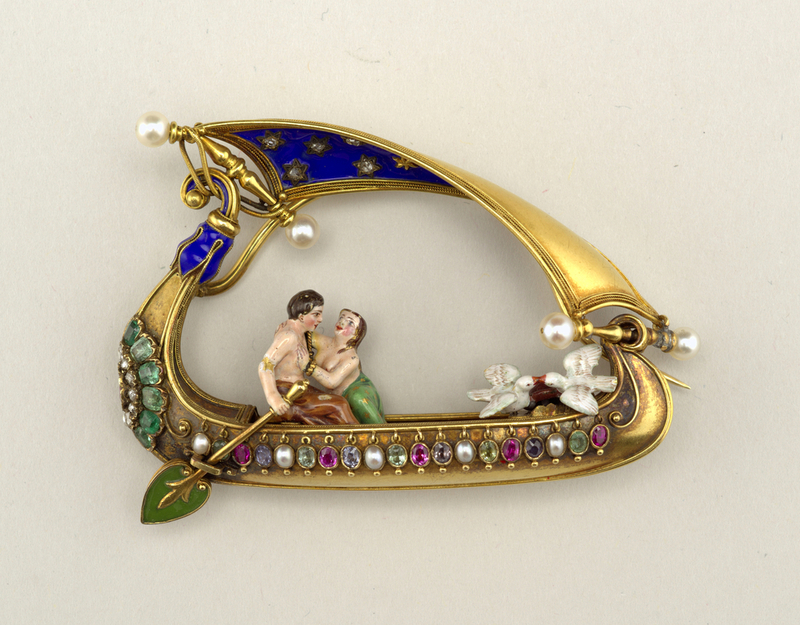 Carlo Giuliano (1831-1895) was part of a family of jewelers from Naples, Italy, whose work was well-regarded all over the world, particularly in London where their reputation centered on the authentic simulation of antique and Renaissance styles. Carlo once worked for Alessandro Castellani where he established a branch of the Casa Castellani in London. After leaving Castellani in 1867, he worked for other prominent London jewelers including Robert Phillips and Harry Emanuel. He began to adapt Renaissance-style designs on his own and worked on developing new techniques when he set up his own workshop as a goldsmith in 1875. Giuliano was quite well-known for his work in granulated gold and encrusted enamel, as well as being inspired by Greek and Etruscan styles while working for Castellani. He first set up a retail shop in Piccadilly in London in 1875, and work in the shop was carried on by his younger brother Frederico and his nephew Ferdinando. Giuliano’s work was intensely popular among members of high society, and it is believed that he personally crafted a piece for Queen Victoria. Eventually Giuliano’s sons inherited the shop, but they never achieved as much acclaim as their father. The Carlo Giuliano brand still exists today, continuing his legacy as a goldsmith and jeweler. Erin Benedictson was an Alberta-Smithsonian summer intern in the Product Design and Decorative Arts Department at Cooper Hewitt, Smithsonian Design Museum.